With this week’s 5 Neat Things, we’ve come to the and of my March bed-making challenge, LAMOB. The idea was this: Make your bed every day in March. That’s all! Lots of people do this thing and if you gave it a whirl this year, I’d for sure love to hear what you thought of my little behavioral experiment. But also: A part of all of this, that’s not required but that I definitely suggest you consider, is rewarding yourself at the end of the challenge. I’ve rounded up five items that you might want to treat yourself to at the end of an entire month of making your bed! 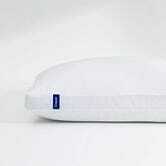 There are all kinds of mattress toppers (memory foam, wool, various synthetic options, etc.) but I’ve got feathers on the brain because I have a feather mattress topper and the horrible, evil thing MOLTS. So I need a new one, and maybe you might want one too because gosh, feather mattress toppers — provided that they don’t spew feathers all over the place — are a DELIGHT. This topper has a 3" loft, so it will add softness to a mattress (and help if you tend to sleep hot, too!) 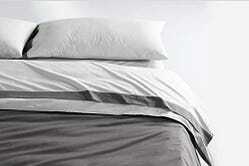 without requiring that you go out and get new, deeper pocketed fitted sheets. 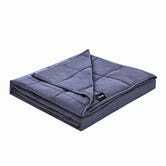 Weighted blankets are so big right now, and so many people have found that they really help with anxiety. Some people use them for sleeping, while others — especially those who tend to be more active sleepers — use them as couch blankets; if you’re a nervous traveler, a weighted blanket may also be worth trucking around with you. The math of weighted blankets is to select one that’s about 10% of your body weight. And now that you know how to clean one, and the criteria to consider before making the purchase, what are you waiting for?!? Cashmere throws are so so so splurge-y, but they will also last a long time, provided you take good care of them, and they’ll bring you oh so much joy. 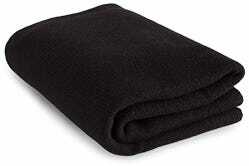 This blanket is made from 4-ply Loro Piana cashmere, which is super fine, so the blanket is both lightweight and warm. 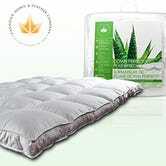 Because of its weight and size — 35" x 65" — it can pull double and triple duty: Use it on the bed in the winter to wrap around your shoulders when you hop into a chilly bed. Or leave it in the living room for use as a couch blankie in the summer when sometimes the AC makes you wish you had something to cover bare legs while you chill with a movie. Or just roll it up sleeping bag-style for use when traveling by air, train or car. Monograms are a very specific aesthetic that is for sure not for everyone, but this is my column and I love-love-love a monogram. 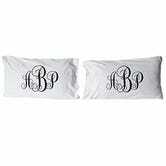 If you’re unsure about whether the monogram life is for you, pillowcases are a good place to start: You can put them out on display them, or hide them behind other pillows or under a bedspread if you start to feel a little too narcissistic about plastering your initials on your sheets. I don’t know why you would feel upset by that, but then again, I plaster my initials on pretty much any- and everything I can, so. It’s a pretty obvious reward for a month of good bed-making behavior but nonetheless: New sheets! New sheets are so nice, and this set from Casper is high quality (400 thread count! 2-ply construction! Supima cotton!) without being totally bank-breaking. The other nice thing about the Casper set is that the design is neutral enough that you can tjuz it up with more decorative or patterned items if you so choose — like, oh hmmm I dunno, a set of monogrammed pillowcases — or stick with it as is for a more minimalist, tailored look. 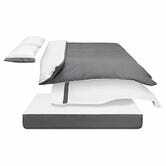 Plus, Casper’s bedding line also has duvet covers, pillows and, of course, mattresses.